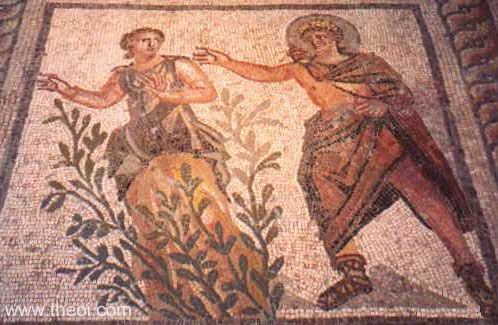 The nymph Daphne is transformed into a laurel tree as she flees from the amorous pursuit of the god Apollo. The nymph is depicted in the midst of metamorphosis with laurel-branches springing forth from the earth to envelop her. The god, his head crowned with a shining aureole, reaches out to grasp her.